Hallie has never had any trouble flashing a turned-down mouth and furrowed brow, but Will struggles more and more with each annual round of Grumpy Packer Backer photos. Angry faces just don't come naturally to him, thank goodness. Because of Will's (according to Hallie) inability to "look right" for the picture, Hallie decided she needed to coach Will this year. I snapped away while she provided feedback: "what are you doing with your face, Will?! You don't look angry at all! And those aren't mad arms, those are sad arms!" If I've said it once, I've said it a hundred times: the Halligator has a future not in football fandom, but in theatre. 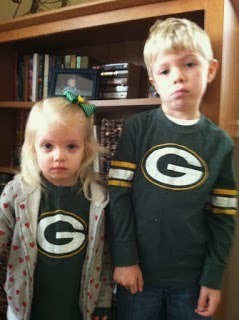 This tradition of Will and Hallie wearing their disappointment on both their faces and torsos began in 2012 will continue as long as is necessary…hopefully 2019 will see our Green Bay Packers rise to the top once more.